that was Rich’s full intention. app”, which means it will run on the iPad, iPod Touch or the iPhone. The consumer only has to pay once. charts display superbly on the bright sharp screen. if you want to add to the route. Simply tap out your course. matter of tapping on routes and picking the one you want to navigate. activated the my first route. self-contained, fitting all your needs. much more sensitive, and I found the accuracy to be quite good. so it stays stable in my cockpit. how valid my satellite signal is. viewable display, which has worked beautifully on the boat. particular track, the date, Lat/Lon, speed over ground, and heading. If you are seriously considering a 3G iPad you only have until June 6 to order one and still get “Grandfathered In” to the unlimited data plan and you have to sign up for auto renew and stay on it permanently to avoid losing it. After that it will be $25/month for 2GB with overage fees above that, which could be very limiting if you plan to use it as your main internet source onboard. Beware though, that since this is specifically a no contract deal, they can change the terms and data limits anytime and as often they want. Possibly as soon as they think they can get away with it. ATT says that 98% of their data users use less than 2GB but that is based on smartphone users which use tiny screens that are directed to mobile sites. The whole point of the iPad is it’s ability to surf full websites, download streaming videos and music, Netflix movies etc. You (or your teenager) could blow past 2GB with just 2 movie downloads and a few Youtube videos if no Wifi is available where your boat happens to be. If you just want to use it as a plotter, check your email and do some light web surfing you’ll be fine. Don’t buy the 3G thinking you can do more than that. I’m using iNavX myself. I believe it needs to interface with an external bluetooth or WIFI GPS receiver. The internal AGPS can be very unreliable – to the point where I almost hit rocks – and does not work outside the cellphone coverage area. I’m guessing you’re using iNavX on an iPhone, and I agree (as do many) that its GPS is pretty poor. But it will work beyond cellular coverage, or at least the 3GS model will; I tried it 50 miles off Galveston. Apparently, the iPad GPS (only in the 3G model) is quite good. And remember this is a pilot house only type setup. The iPad (I own two) has two humidity sensors inside and if either registers too much humidity, the warranty is null and void. In an average week of surfing only, no downloads or streaming anything, I use about 500 MB worth of data so the unlimited plan is the only way I would use 3G. I’m grandfathered in…. One thing these great little programs are missing and I’ve mentioned it before and will again is what to me is the MOST useful feature (my IQue has it) which is the course heading line which I set to infinity. I use the handheld plotter for positional info in the cockpit to compare a plotted fix on a chart with my observations. When I am head into port or trying to make a buoy or a mark I don’t use a waypoint typically at close range, but turn the boat as observe the course line to see if it is crossing the mark or buoy I am going for. 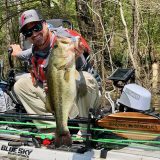 This can even be something I can’t see with my eyes and this heading line will show me whether I am going to pass over thin water or ledges or other hazard. This is more critical than entering a waypoint and getting a compass course which will not show me the above. Of course when the plotter draws a rubber band line from the entry location to the waypoint this is kinda similar, but the heading/course line is continually updated and a rubber band from the entry point is simply an imaginary line which was valid for one instant or if you manage to remain on that line… which is rather unusual. I don’t know what this programmers leave this vital tool out as it’s a life saver and the best use of these little devices in the cockpit. I believe the “course heading line” is the same as the “velocity vector” in iNavX. The velocity vector is a line drawn from the vessel position out X minutes (user selectable) based on speed over ground at the angle of course over ground. 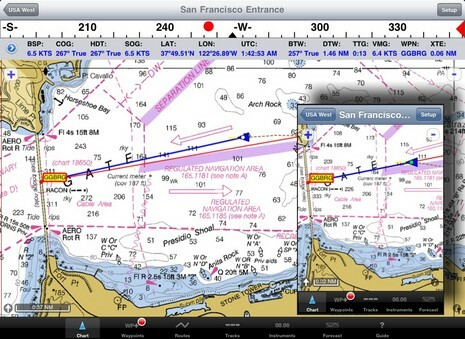 Yellow line is velocity vector..
That would be it, but I don’t see the feature in NaviMatics or Navionics for Iphone. I can’t see how some programmers (navigators) missed this. It’s too early to say the same about the iPad, but i’m guessing it’s about the same. Perhaps conditions are different in Florida, but around here it’s never been a problem. About the price. I was pleasantly surprised to see that if you already bought it for the iphone/touch, you don’t need to buy it again for the ipad. You can use it on both at the same time. 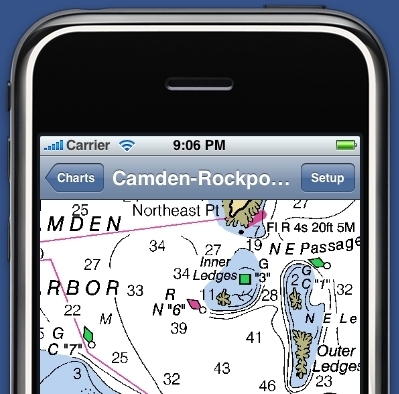 However, the charts are different, so if you use Navionics chart, you need to buy them twice. 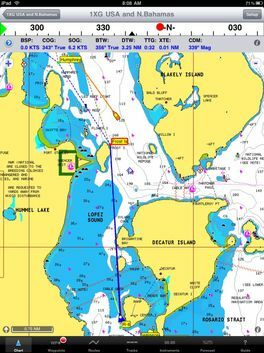 While most use the free official most up to date NOAA RNCs with iNavX, it is true that Navionics requires the charts be purchased for each device (unlike the other charts available from X-Traverse). 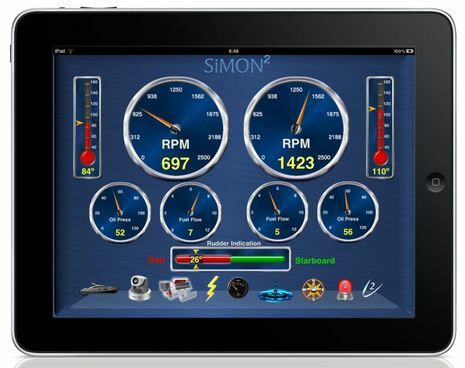 Navionics even have their own iPad specific apps instead of just one app for all devices like iNavX. The good news is the Navionics charts are very low cost. The super regions 1G and 3G are a great deal at $20 or $50 depending on device. 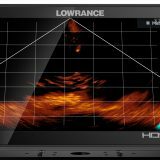 I am not sure how well these work, but I just ordered an antiglare film for my Viliv (an UMPC). I will drop you a line and let you know how it works out. great review and comments thanks. Could someone please post more pictures of the analog instruments? Are there other wind gauges? Also can someone explain the benefits of buying iNavx (AUD$50) rather than buying Navionics (australia) (AUD$15?). Wow that is impressive. If you were able to have multiple instruments on the screen this could replace a lot of kit. Its a real shame the data input has to be wireless. The device has a usb host on it, but it seems access to it is very restricted. The new iPhone 4 has the same GPS receiver iPad 3G has. This is a significant improvement over the lack luster performance of iPhone 3G GPS receiver. Pre-sales of iPhone 4 are through the roof. Tom MacNeil has put together an excellent video showing waypoint and route creation in iNavX .. I have installed four different Navigation programs on my iPad for test. iNavX is my favorite. The only thing i am missing is the GPS satellite chart. Before I bought the iNavX I used Free Technics system but everything with the iNavX and iPad is stunning and to a fraction of the costs. I am waiting for the engine and electrical monitoring system from Aviasail and have tested the current program with navigation instruments. Not so good as Free Technics but the cost make the differences. 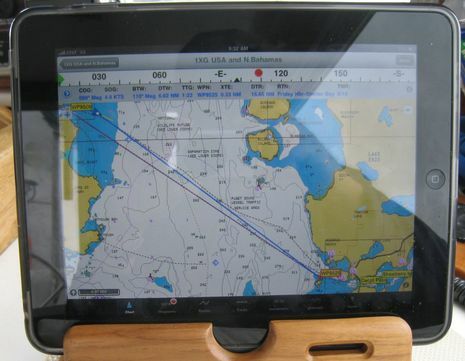 Beside the iPad (as a slave) I have built a Navigation Computer based on the Intel Atom Processor N270 as recommended by Avia Sail. I did it before I saw Avia Sails recomendation. Now I will try to fit a PCI radar board from IRIS system in to this small book-computer. I can tell you one thing so far – this is a Paradigm shift i Navigation and ship control when it comes to price performance. And together with the ship system you have a fantastic entertainment system in your iPad using your wireless network to stream music video and show pictures. I have more but I will tell you about it later. I am using the system with ROV, Magnetometer, underwater cameras and Side-scanners since my boat originally was refitted for diving explorations. I will install all the necessary instruments and senders from Maretron and report my findings. My boat is a 50 feet Riva Super America refitted in Malaysia and Thailand. The boat is refitted like new and have two 440 Hp Yanmar engines. 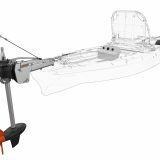 I will test the boat in the Melacca Strait from Singapore to Phuket and in the Andaman Sea. I have a Riva too-a Corsaro 60. Great boat. 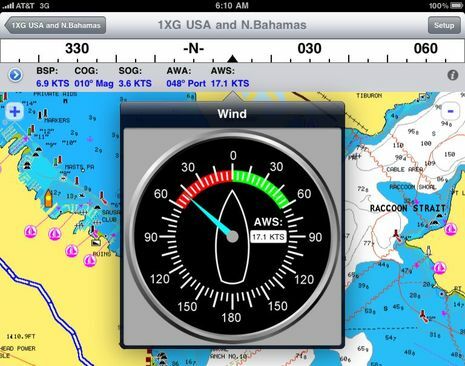 Why did you like the iNavX over the Navionics app for the iPad? I’m interested in a comparison between the two. iNavX 3.2.0 is now available from the iTunes app store. It’s a free update for all iNavX users as we don’t believe in re-charging customers who already paid for iNavX. iNavX 3.2.0 adds chart emailing and printing, and Brookhouse iMux support in the form of sending the active waypoint NMEA data to the iMux output port (i.e. to an AP). iNavX 3.2.1 is already in the works. For those of you who have not experienced the bad news yet, GPS NavX will crash if you upgrade to the most recent version (Yosemite) of the Mac OS X.
I am told by the company that the only way to solve the problem is to spend (another) $59.95 to buy the latest version of GPS NavX or go back to the older OS X. Not very nice. I liked GPS NavX, though not enough to spend another $60 bucks. I have PolarView NS v 2.03 and it works fine under Yosemite and so far all updates have been free.